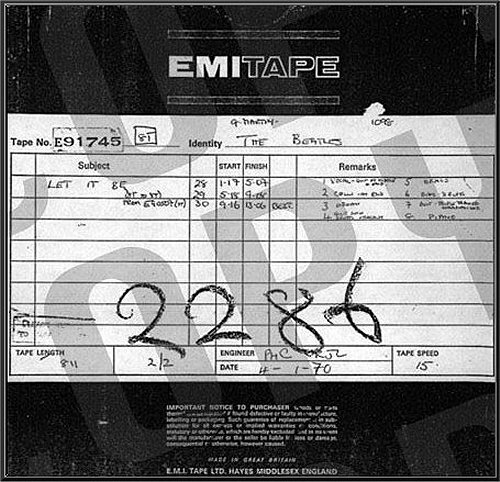 For additional info on "Let It Be (take 30)"
'Let It Be' take 30 is a tape-to-tape reduction mix of take 27 on reel E90507 (here) from 31 January 1969. A second lead guitar, harmony backing vocals and several brass instruments were overdubbed onto the reel. 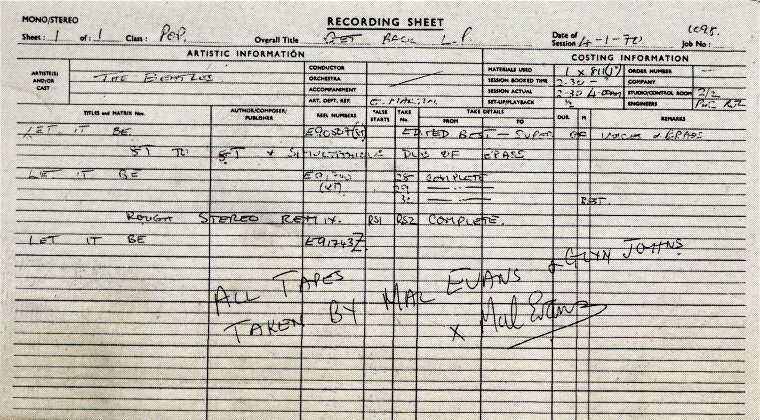 Both the "Let It Be" single and album were them mixed from this reel. This is probably the rejected mix from reel E91743. It features the 30 April 1969 guitar overdub along with the 4 January 1970 harmony vocal and brass overdubs. It can be found on "Unsurpassed Masters Volume 6" on Yellow Dog Records. This is alleged to come from an acetate. It appears to be the single mix (see below). It can be found on "Acetates Collection" on Unicorn Records. NOTE: A recording is circulating perporting to be a mix with both the 30 April 1969 and the 4 January 1970 guitar overdubs. While being an interesting listen, this recording is fake. It can be found on "Get Back 2nd Mix" on Strawberry Records. This is the "Let It Be" single mix. The single was released in March 1970 but fearured the 30 April 1969 lead guitar overdub and not the 4 January 1970 guitar overdub. This mix also features the harmony vocal and brass overdubs from 4 January 1970. It was actually mixed onto reel E91743. It was compiled 13 February 1970 on reel TL21621. This can be found on "Past Masters Volume 2". This is the "Let It Be" album version. It features the 4 January 1970 guitar overdub. This was mixed (RS1-4) by Phil Spector on 26 March 1970. Spector edited RS1-4, calling it RS1. This was likely reel E97131. The mix was compiled 5 April 1970 on reel AR16216 "LET IT BE" STEREO LP (YEX 773/4).